For the more professional player, or for those who like a challenge, we have a match table. This table has "smaller" pockets and is a higher quality table & cushions, but we recently had them widened to their current size as they were too tight! We have a wide range of new 3/4 sized snooker tables, full sized snooker tables and both Pool and American Pool. Our table fees are £7 per hour calculated on a minute by minute basis so you can play for as long or as little as you like. 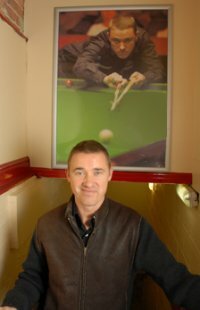 Stephen Gordon Hendry, MBE (born January 13, 1969 in South Queensferry, Edinburgh) is a Scottish professional snooker player. In 1990, he was the youngest-ever snooker World Champion, at 21 and has so far won the honour on 7 subsequent occasions. He was also snooker's world number one for eight consecutive years, between 1990 and 1998, and also in 2006-07. Hendry also holds the distinction of most world ranking titles (36) and leads the field with well over 700 competitive century breaks. To date Stephen has won 74 professional titles putting him second on the all-time list, behind Steve Davis. However, Hendry is the record holder for the number of ranking titles won, with 36. In addition, he has won four team titles as well as several amateur titles. Stephen currently holds the record for the longest unbroken streak as a top-16 player (22 seasons). His other career records include: consecutive wins of a single tournament, longest consecutive winning streak (in ranking events), most centuries compiled in one match (7), most centuries compiled in one tournament (16), most centuries in one season (52), most years ranked world no.1, most career centuries (over 700) and highest total prize money. In the 2009 world championships, he regained joint possession (with O'Sullivan) of the record for most 147s compiled in competitive play (9), as well as most televised maximums (8).